The latest in the series of sets celebrating Chinese New Year has been revealed! 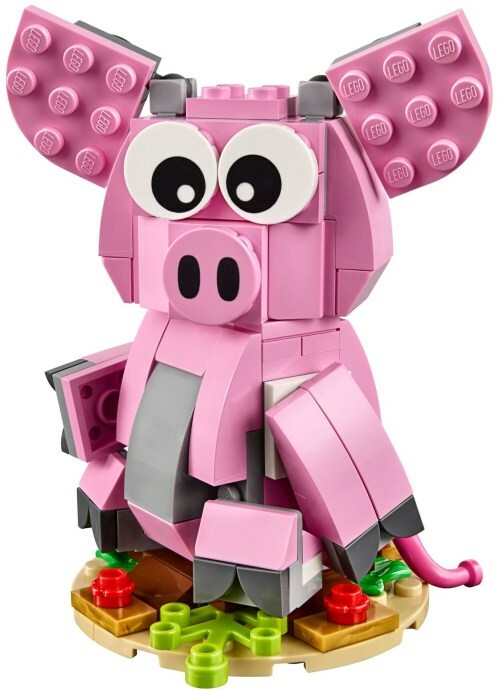 There's no word yet on when and where 40186 Year of the Pig will be available outside of the Asia region but given that this year's 40235 Year of the Dog is available as shop.LEGO.com we can hope that this one will be available everywhere, too. Thanks to Vinh for the image. Looks weird to me. It could be improved quite a lot. The ears remind me of Dumbo more than a pig. Doesn't look like a pig to me, not a fan of this teddy-bear look. The best one was the year of the dog set. Snake one was pretty lame (it's a snake, c'mon! ), but it had cool alternative builds. Whoa! The image on the box shows it holding a box of itself! But the image on that box it is holding isn't holding anything! This could mean something... or more likely, mean nothing at all. That's all folks! Am I the only one whom the first thing that came to mind was Porky Pig?! On another note, can't wait to get it. @ALFIE22: I suspect that whatever budget they had for new elements/recolors must have already been used for other parts of the build. I agree that could possibly make a better pig tail, though. @mafon2: The Year of the Snake one was very different from the rest, seemingly because it was just a slightly modified version of Creator set #6914-1 Prehistoric Hunters from the previous year. In fact, the only parts in the set that WEREN'T in 6914 are those used to construct the decorative gate/arch structure, which were also bagged separately. Even the instruction manuals for the three alternate builds were taken straight from 6914, as can be seen in this review: https://www.eurobricks.com/forum/index.php?/forums/topic/81003-review-10250-creator-year-of-the-snake/ Perhaps it was meant to "test the waters" for a Chinese New Year set before really committing to coming up with brand new set designs that required more unique inventory/contents. @CarolinaOnMyMind: I suspect that is not a box it's holding but rather a money pouch meant to be analogous to a red packet/red envelope: https://en.wikipedia.org/wiki/Red_envelope The previous Chinese New Year animal sets contained similar yellow-instead-of-red packets decorated with the set's box art, as can be seen in this review: http://jaysbrickblog.com/2018/02/05/review-lego-40235-year-of-the-dog/ The idea, as illustrated on the back of the box is that the buyer of the set opens the set, puts money in the pouch, and closes the box back up before giving it to the intended recipient. Overall I think this pig is pretty cute! The first thing it reminded me of was the pigs from the various books and greeting cards illustrated by Sandra Boynton. I love the use of the 1x1 quarter circle tiles for its toes, as well as its pudgy face and tummy! I need this. But the monkey one was easy enough to Bricklink if it doesn't come to the U.S. In either case, I am glad they are continuing with this series. Easy pass. Not only does it not add anything substantial to my collection, but also it just looks lame. I mean seriously. What pig have you seen that can sit up like that by itself? I'd love if the dog one came to the USA, so cute. Don’t like it. Quick question: why aren’t there sets for the rest of the worlds New Years? Like a set about fireworks or something? Umm, year of the dog is not available 'everywhere' on [email protected] Just in the UK. @Your future president: Plenty of pigs in cartoons can sit up like that. Many can even stand on two legs. No need to think of it like it's supposed to be a realistic representation of a pig, particularly when features like the eyes are already stylized in a cartoonish way. @DaftArcher20968: Probably because it's so close to Christmas, which tends to be much more heavily associated with gift-giving traditions than New Year's Eve/New Year's Day (particularly in Australia, Europe, and the Americas). Chinese New Year/Lunar New Year are both further away from Christmas on the calendar, and most important and widely celebrated in societies and cultures in which Christmas is historically not as big a deal. @DaftArcher20968 Lunar New Year or Chinese New Year is the most important gift giving time of the year for a substantial part of the globe. There have been numerous Christmas themed sets made by LEGO, several a year for the last decade. It is not analogous to compare it to New Years Eve, which is celebrated in Asian countries as well but does not involve gift giving to children traditionally. So Lego disses everyone one the Chinese New Years sets and give us this pink mess instead? Yeah, thanks for nothing Lego. ^^^ Ceci n'est pas un cochon? An entirely fascinating concept, but why stop there? I'm quite confident that this pig is actually the representation of a representation of a representation of a representation of a cartoon pig. In unrelated news: Christopher Nolan just acquired the film rights to Peppa Pig. Alternatively, this pig could be based on a 4-year old child's drawing of a pig. Or on the idiom "If pigs could fly" -- maybe those are wings, not legs! What a shame we'll never know. P.S. I'd love to see the cartoon that 75530 was based on. That should be well trippy!